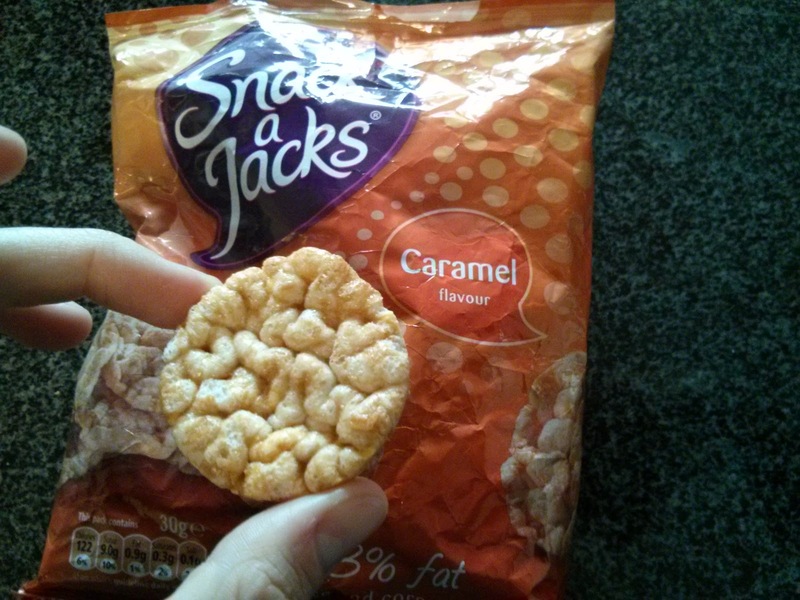 What would you guess an item called "Snack a Jacks" is? Yeah, I had no idea either. They are ... rice cakes, in fun flavors. Available in large size like a standard rice cake, or in small bite sizes. Flavors span from savory (salt & vinegar, cheese, sour cream & chive), to sweet (caramel, chocolate chip), so something in between (barbecue, sweet chili). Of course, I went for sweet. Oh, and only available in the UK. Well, what can you say about rice cakes They are ... rice cakes. I liked the bite size form, they were very snackable, and you know I like my snacks. The caramel flavor was actually quite deep, and the cakes had far more coating than I expected. Overall, not bad. Far more interesting than I was expecting. As you've been reading about on Tuesdays for the past few months, I went on a pretty epic trip to Tokyo. 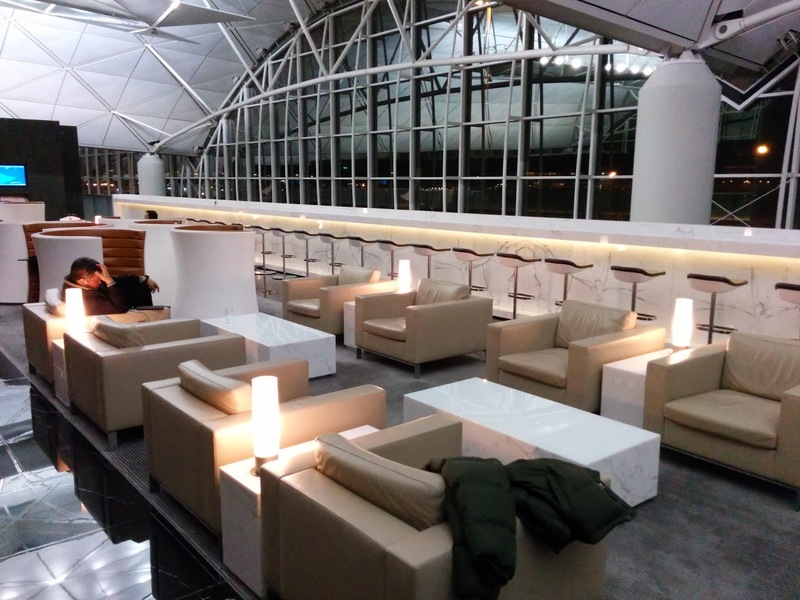 And, I made the crazy (and very, very wise) decision to change my return flight to include a stop in Hong Kong, rather than fly direct, just so I could fly First Class on Cathay Pacific. The first leg of my journey was mind blowing, and I couldn't wait to see what else was in store for me! 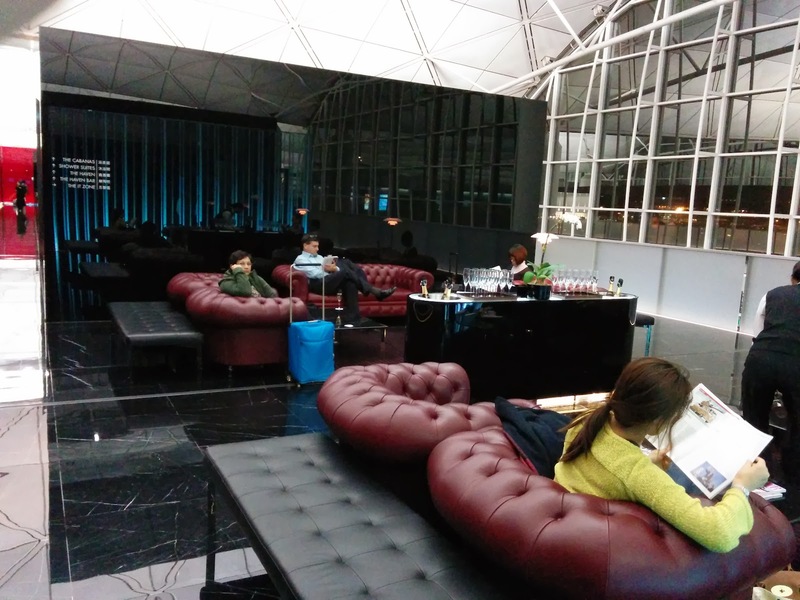 First, I had about 4 hours to burn at the Hong Kong airport, thus, ample time to explore the lounges! Explore (and, eat) I did! 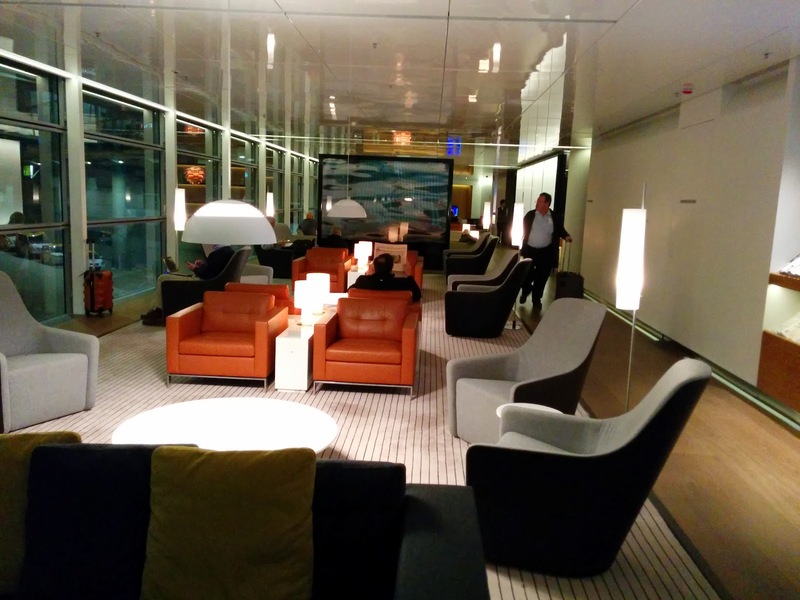 I started with the first lounge I encountered after stepping off my flight: The Bridge. 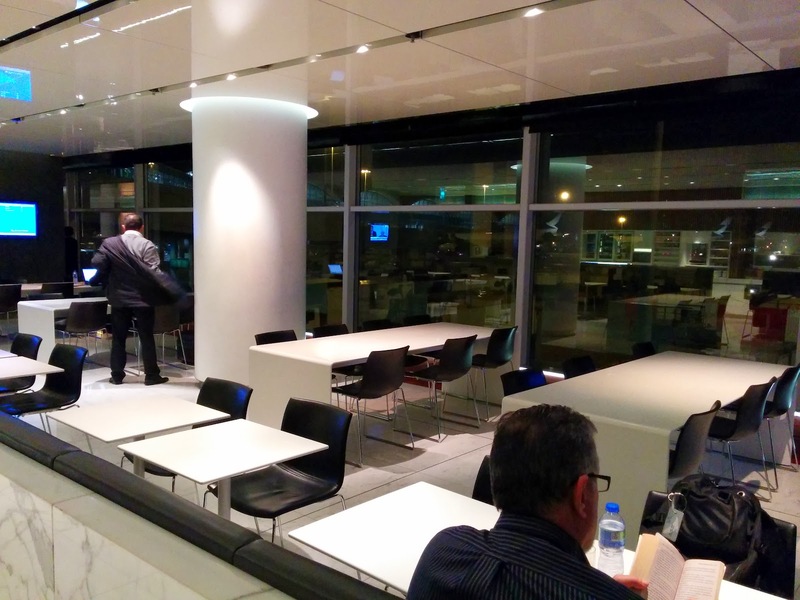 It is a single class lounge, a fact I was reminded immediately upon entering. They suggested immediately that I might rather go use the First Class lounge instead. I did, eventually, but I knew that the Bridge had … a bakery! Like I could skip this lounge. 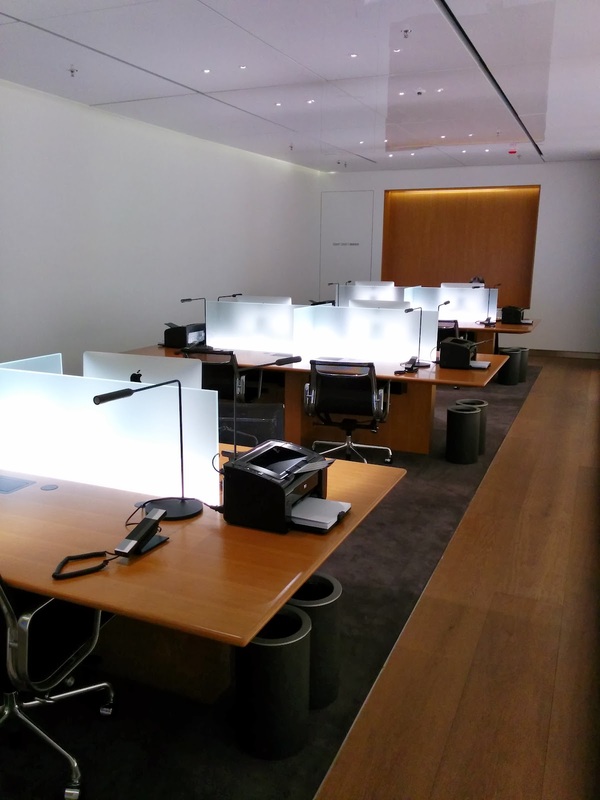 The lounge was quite large (2,567 square meters! ), with two wings, tons of food sections, and wasn’t remotely busy. Light music was playing in the background. 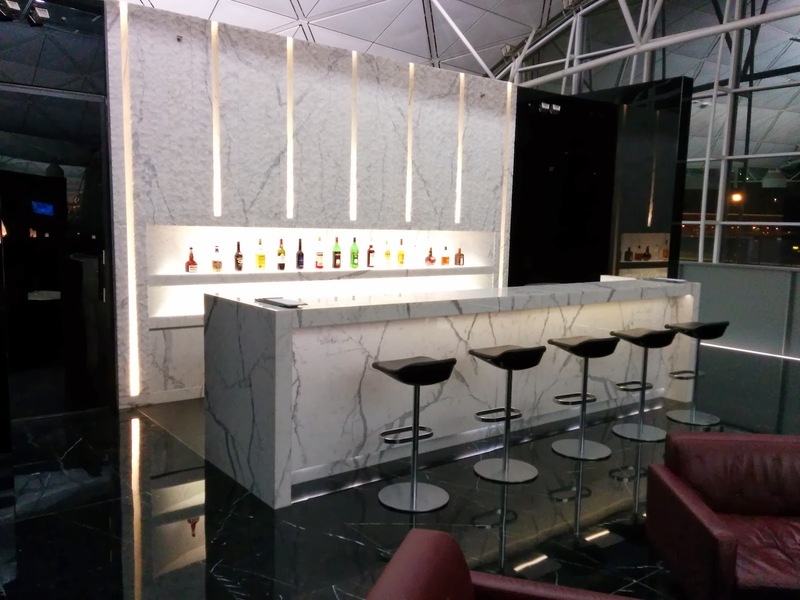 If I didn’t know about the other lounges, I would have been more than content to stay here. But, Emil had instructed me that the only lounge I should spend my time in was the Wing, so I made my stay at The Bridge fairly brief. The lounge had a lovely feel, filled with couches and leather chairs near the entrance. It was bright, airy, and modern. 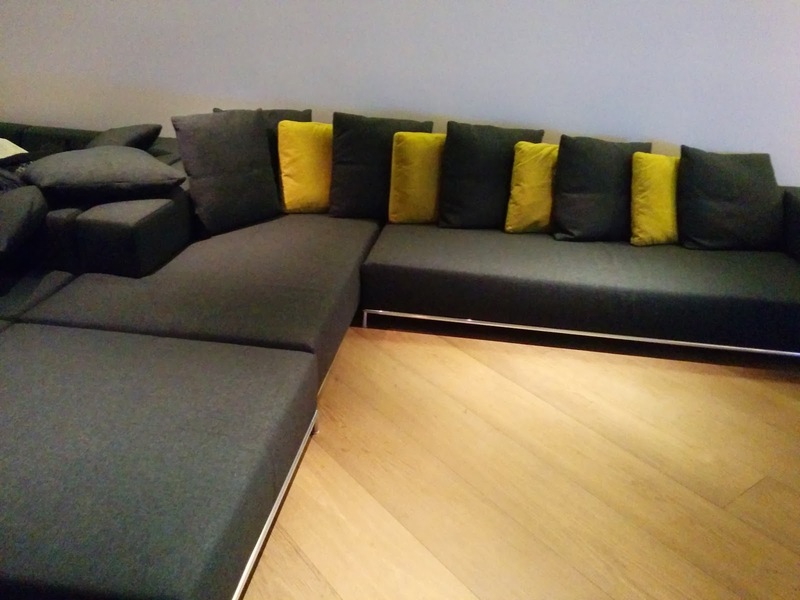 The designers say it is supposed to feel like a living room, albeit a very large one! 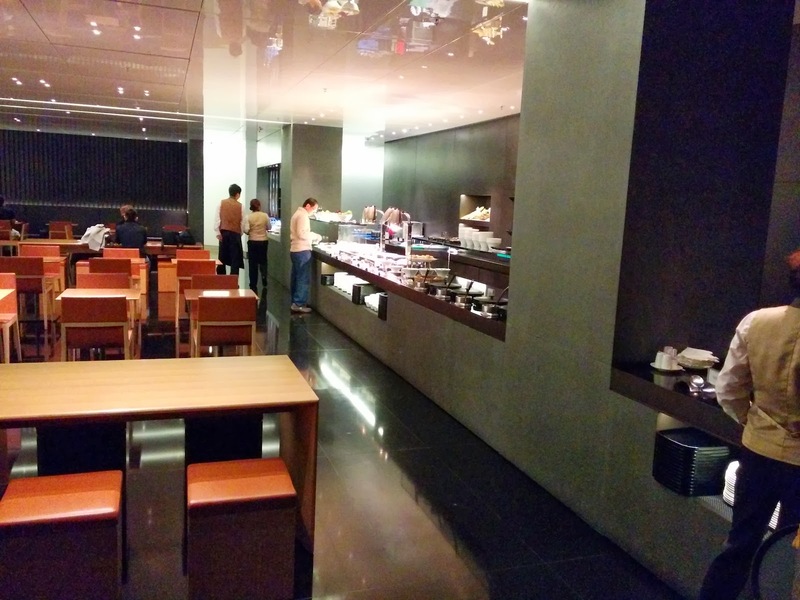 It was night and day compared to the JAL lounge at Haneda, not that that one was awful. It looked comfortable to hang out in, but I was there for one reason, and headed straight for the Bakery. 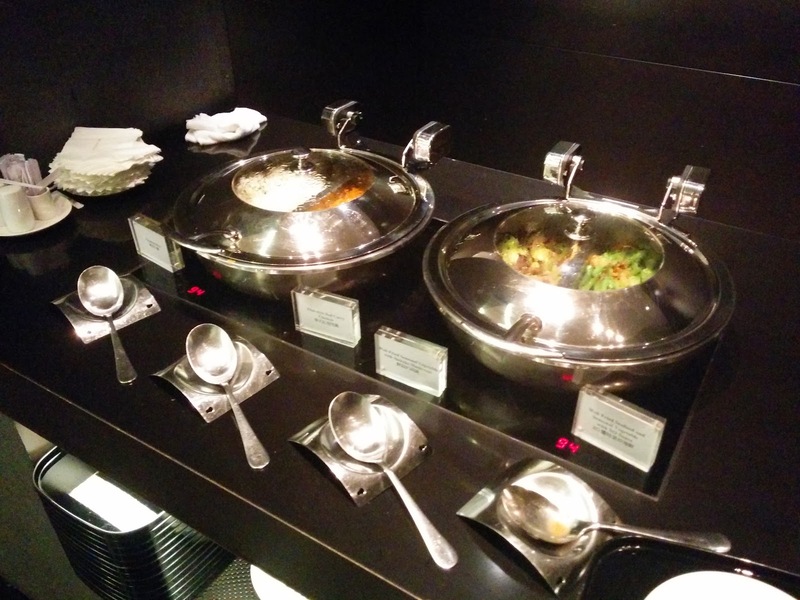 The food is buffet style, with abundant table seating. The food options were extremely varied, although I never quite figured out why they called it a bakery ... as there weren't really many baked goods. The first section reflected where we were: dim sum! I started with a vegetarian dumpling, which was quite tasty. The skin had just the right amount of chew to it, the filling was flavorful. There were different sauces to dip it in. 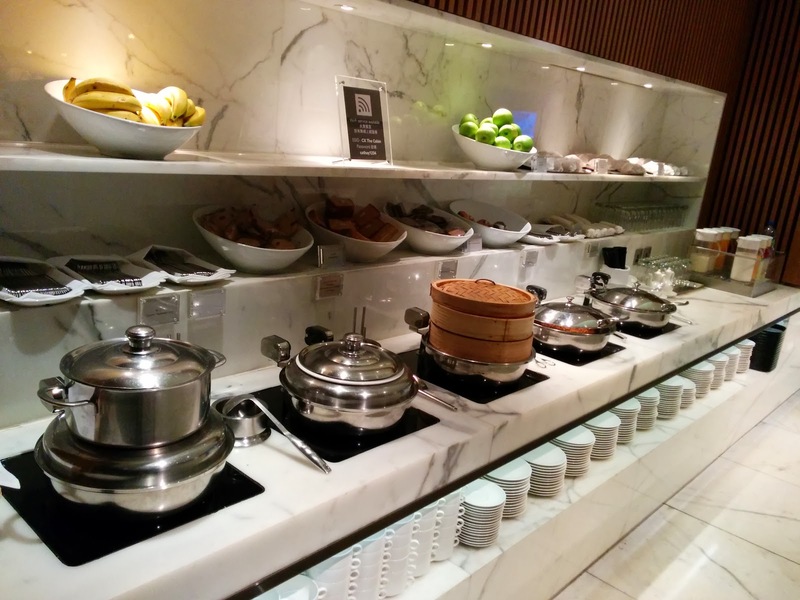 Better than most dim sum I have in the US, and this was an airline lounge buffet! There was also another type of beef shumai, but I didn't try that. Next, stir fries. One was vegetarian, one was mixed seafood in XO sauce. I dug out some broccoli, smothered in delicious sauce, and quite enjoyed it. It has been a while since I’d had Chinese food, and even though I was not remotely hungry, I enjoyed it quite a bit. Next was a spread of soups, freshly baked bread, and pizza. I skipped these, as I saw something much better straight ahead. Bread pudding with vanilla sauce! Unfortunately, it sounded better than it was. It was served warm, which I liked, but it was soggy. The flavor was quite nice, with cinnamon and raisins, and the interior was very moist, but the top layer really should have been crispier. I of course appreciated the vat of vanilla sauce on the side to drizzle over it though. I moved on to the next carb-y breadfast-y good: scones, served with very tangy cream. Plain or raisin were available. I went for raisin. The scone was legit, with a cream wash on top, but, fairly boring. The cream I was hoping to be like the clotted cream from my pie on the plane, but instead it was way too tangy for me. This was all good, but seriously, I wasn't hungry, and didn't want to waste stomach space on just "good". Dim Sum: Egg Custard Tarts, BBQ Pork Buns. And then, more dim sum! BBQ pork buns and egg tarts. 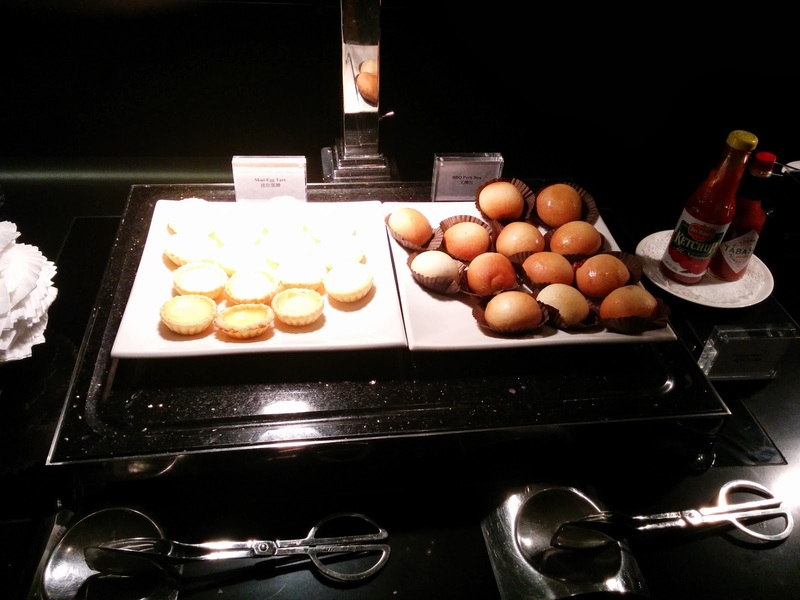 I had read about the egg tarts before my trip, and they were pretty much why I was here. I love egg tarts! Up ahead, I saw even more desserts. This was getting rough. I wasn't hungry when I walked in due to my ridiculous feast on the flight over, but I'm incapable of resisting the urge to try things, particularly desserts. I did skip the chocolate mousse since I didn't want caffeine, but there was also creme brûlée! Now, you know me and creme brûlée. I like it so much that my blog has a label for it. I had no expectations for this, since it wasn’t made fresh to order. But, it was quite good. The top was nicely caramelized, a thick layer, very flavorful. The interior was creamy. For one that wasn’t fresh, this was pretty fantastic. I was glad I tried it. Next up was a salad station. Why was this AFTER the desserts? Aren't we supposed to be encouraged to fill our plates with the salads first? 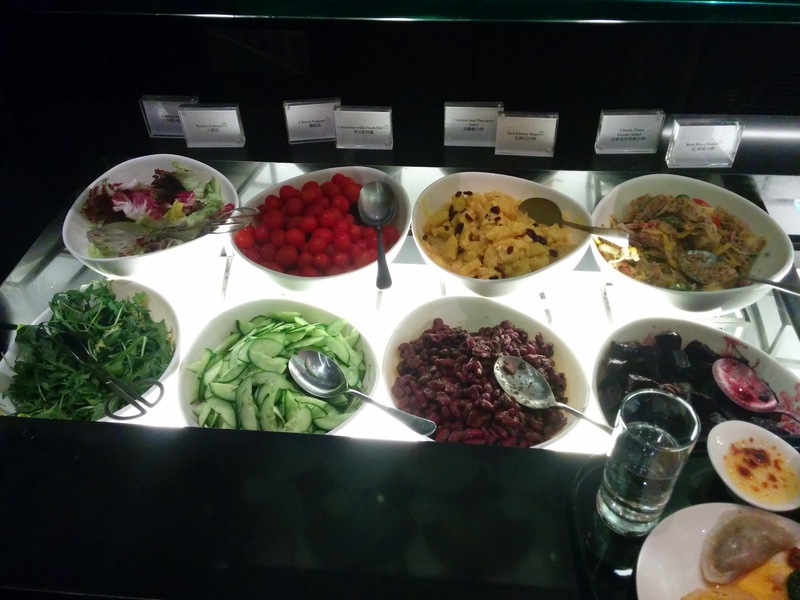 The salad station contained two types of greens, cucumbers, cherry tomatoes, beets, and kidney beans to make a little salad, plus a chicken and pineapple and tuna niçoise salad. I skipped all of this. At the end was a drink station with coffee, tea, juices, and a few canned beverages. Dining Area at The Bakery. 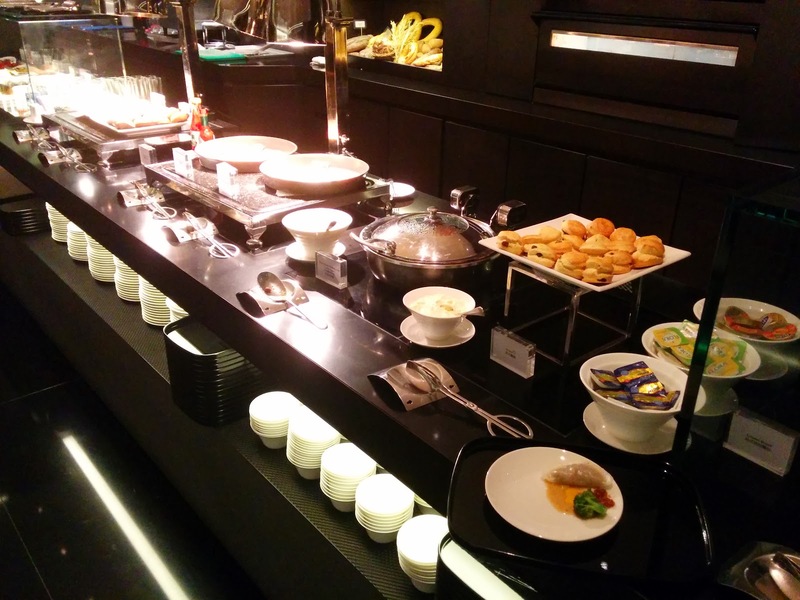 As I sat and dined, I was quite impressed with the buffet staff. As any item was removed, a new one was put in its place. Nothing was ever even remotely empty. They ran a tight ship. Once I’d calmed down from my excitement over the Bakery, I moved on to the bathroom. I couldn’t find it originally, as it was hidden down a hallway. Even when I exited, I had a hard time finding my way back out to the main area. I’m not sure why they made this so hard. 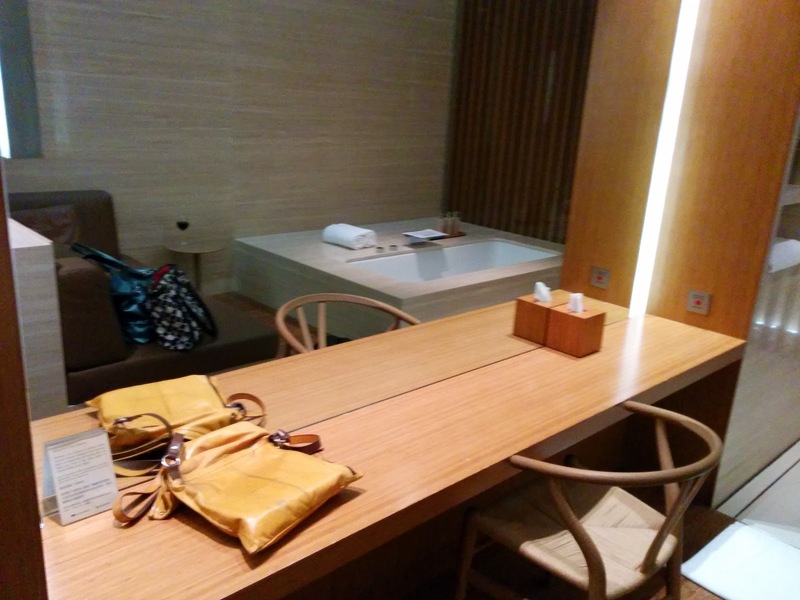 Anyway, standard nice bathroom, lotion and facial cleanser for amenities, staff there cleaning up every thing behind you. 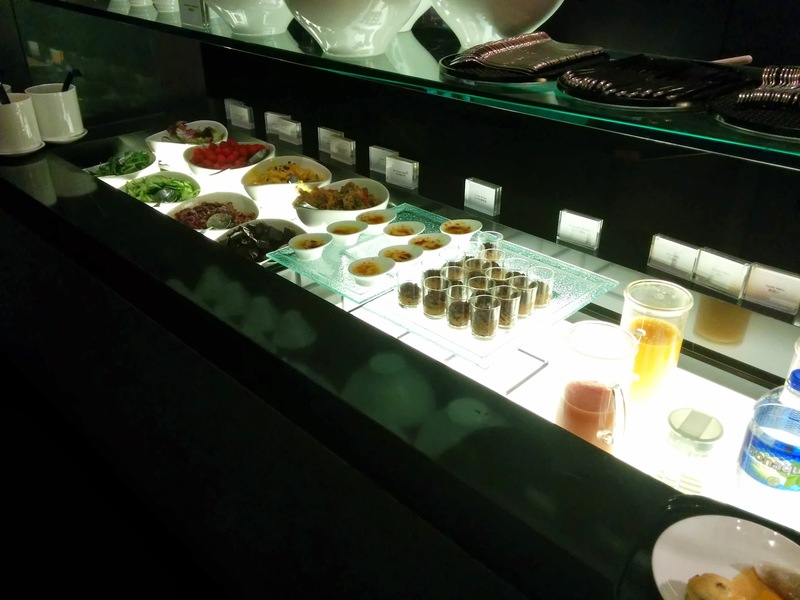 Next, I found my way to the Long Bar, serving cocktails and wine, with assorted snacks laid out at regular intervals. Snacks included finger sandwiches, a bunch of different types of cookies, mixed nuts, tuna tartar, and chips and dips. 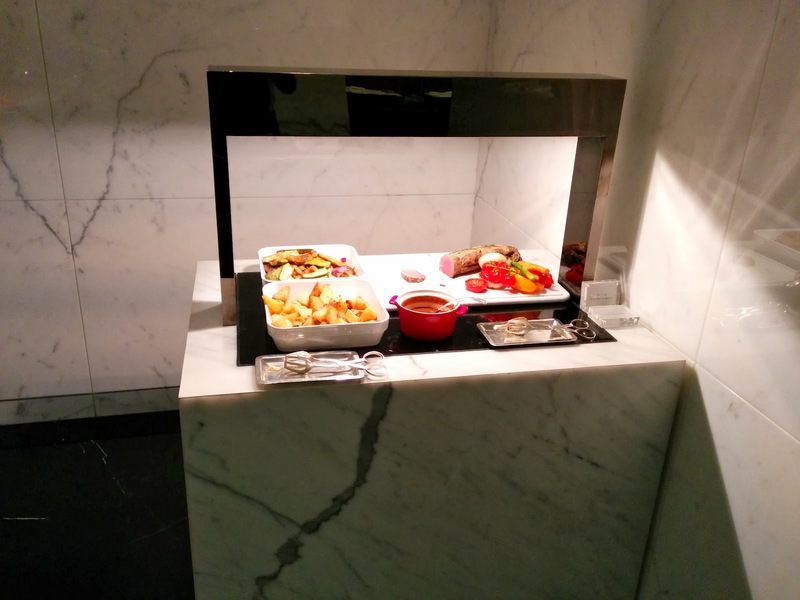 You really won't go hungry in this lounge. I skipped this section. There were also couches large enough to sleep on, which people were certainly doing. I nicely didn't take their photos. But all of this was just one side of the lounge, I then moved on to the other wing. More comfortable seating, this side had a different style, but was still modern and airy. 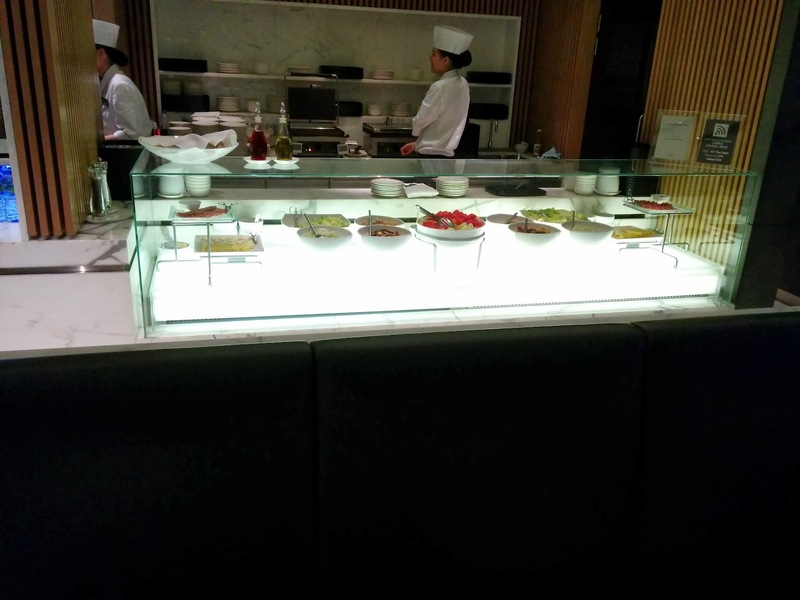 I stumbled upon yet another food area, The Bistro, filled with more dim sum, Chinese stir fry, curry, rice, tea sandwiches, salads, and veggies. Oh, and cookies, tiramisu, chocolate mousse, cheese and crackers, and fresh fruit. 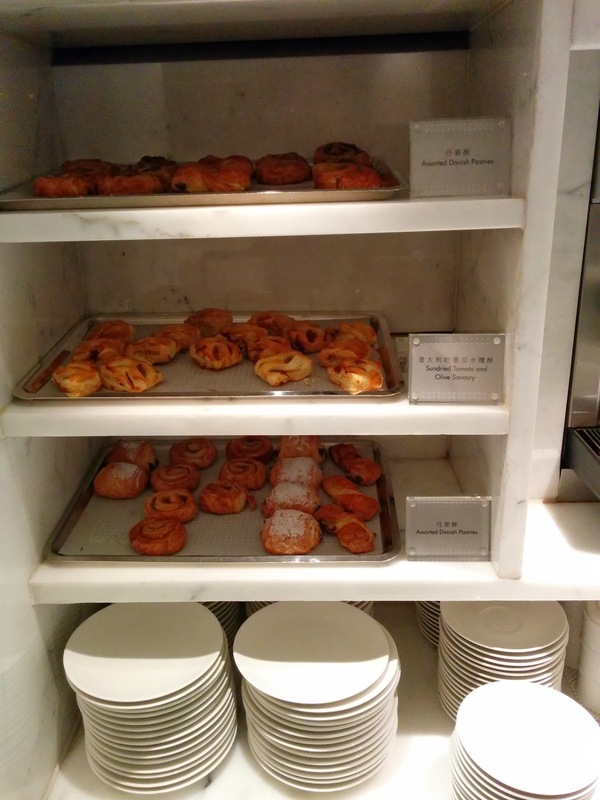 It seemed like a smaller version of everything I’d seen in the Long Bar and the Bakery combined. There was also juice, and coolers with a few beverages, tea, coffee. I continued my journey, past the shower area (didn’t poke my head in there), to the IT Zone with computer desks, printers, phones. No reason for me to stop here. Fresh Lemon and Mint Water. At the end of the corridor was a total surprise: a deserted coffee bar, the Coffee Loft, with a very legit looking espresso machine. A barista materialized offering to make a drink. But I just wanted water. The coffee bar menu listed fresh lemon and mint water, so I ordered that, expecting a jug of water to be pulled out. 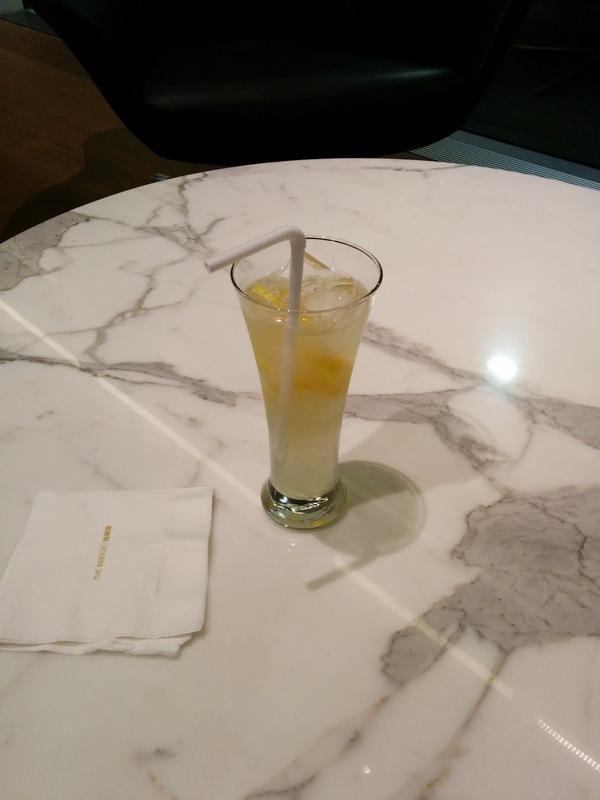 Instead, she started muddling lemon and fresh mint, preparing my drink. It was delicious. Refreshing, and really just what I needed. Also at the coffee bar was more cookies, more sandwiches, more types of cake. And, in a little cove nearby, you guessed it, more tea/coffee making facilities, sandwiches, and cakes. 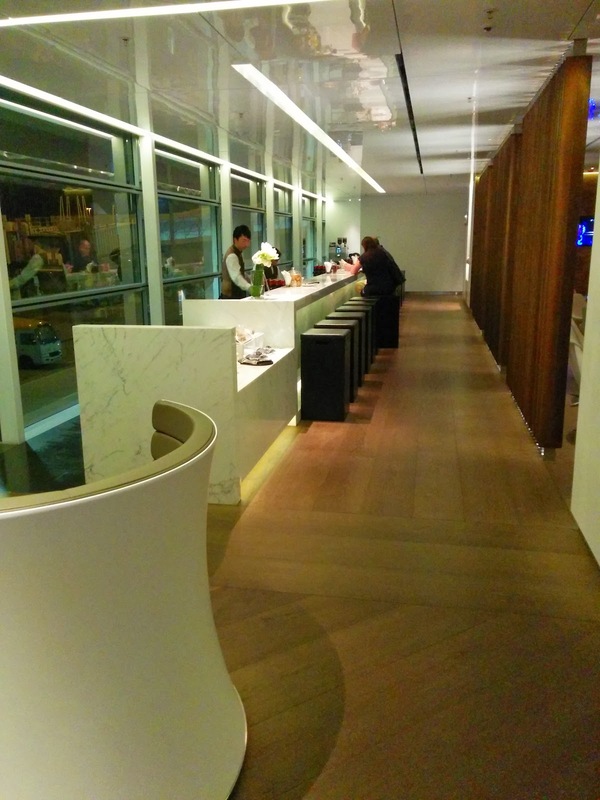 I skipped most of the other lounges. 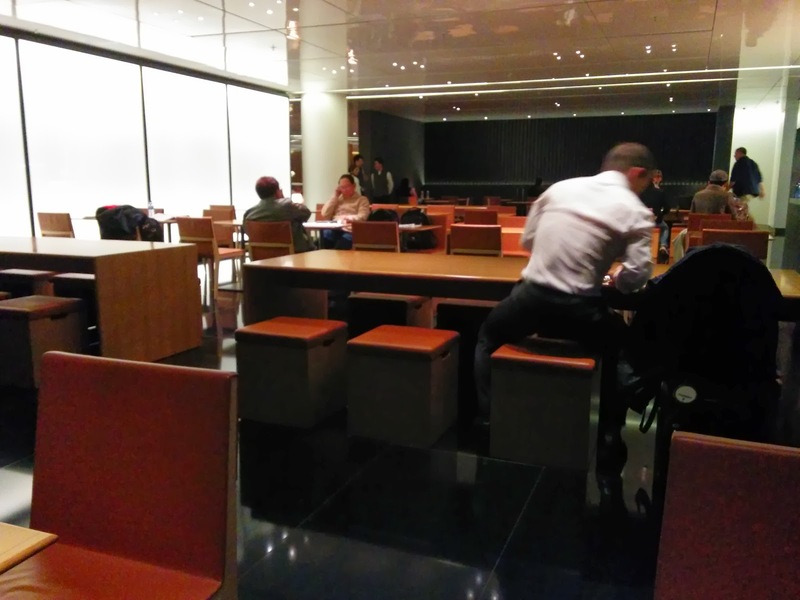 I’d been to the Pier very briefly when I flew to Tokyo, and the others weren't considered premiere lounges, so I passed them up, finally heading towards the lounge Emil had most recommended. I was planning to skip the Cabin as well, but I was walking by and decided to just check it out. I'm not sure why. I should have known better. It wasn't really worth stopping at. The most notable element was the interesting seating options. 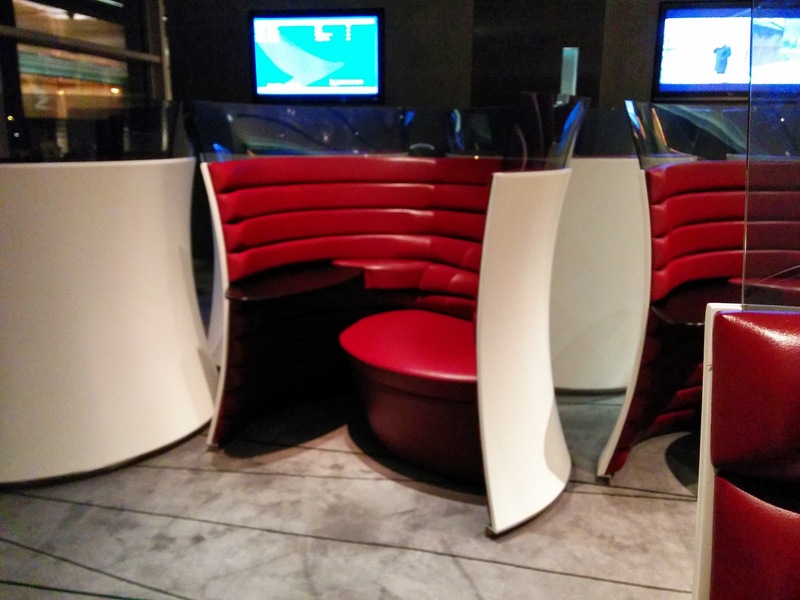 I didn't try sitting in them, but they looked cool, and semi-private. The dining seating however was far less interesting. It looked like a cafeteria. The dining selections were far simpler in the Cabin, just a little buffet with more dim sum, bread, and a few other options. It also had a fresh deli area with made to order sandwiches and salads, and a fresh squeezed juice bar. 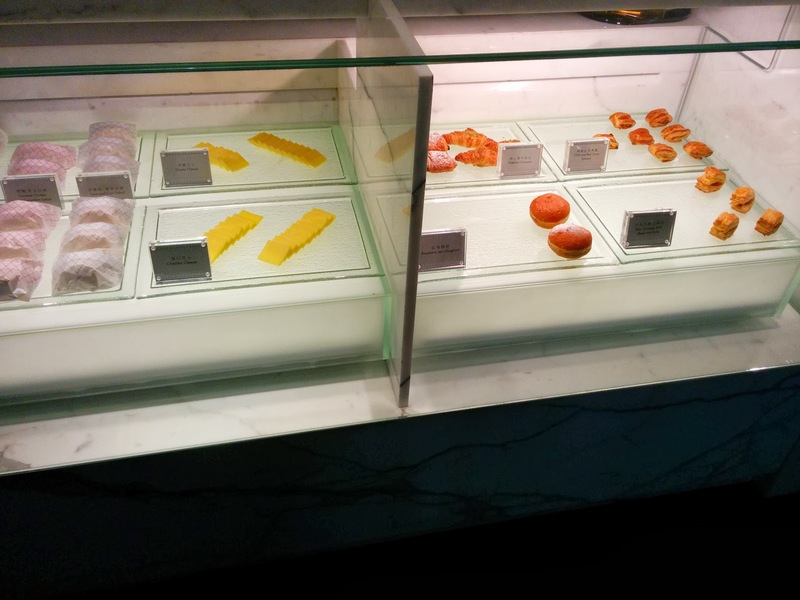 I was a bit excited to see the pastry selection, but they weren’t actually very good. I quickly left The Cabin area and moved on to the Wing, finally. I needed to see what all this fuss was about. 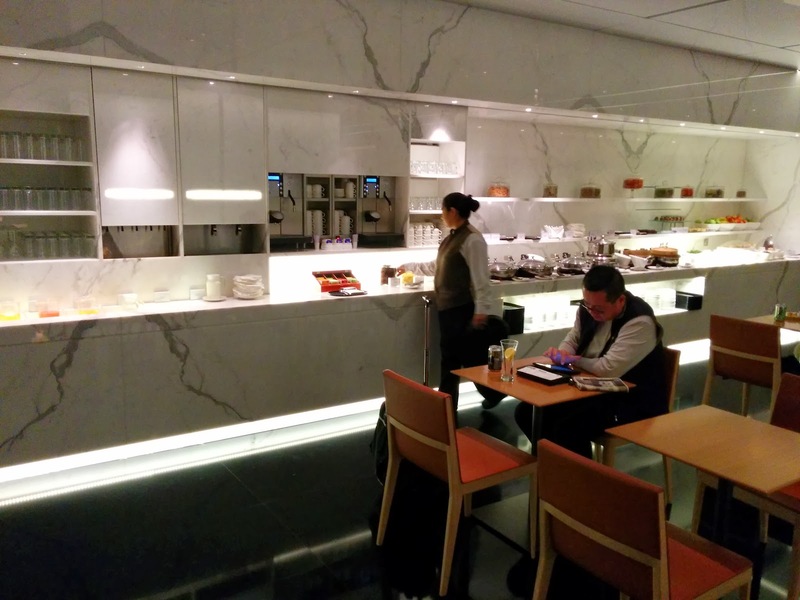 The Wing is THE flagship lounge for Cathay, and it shows. I was pretty confused when I entered. I was sent straight up to the First Class area. 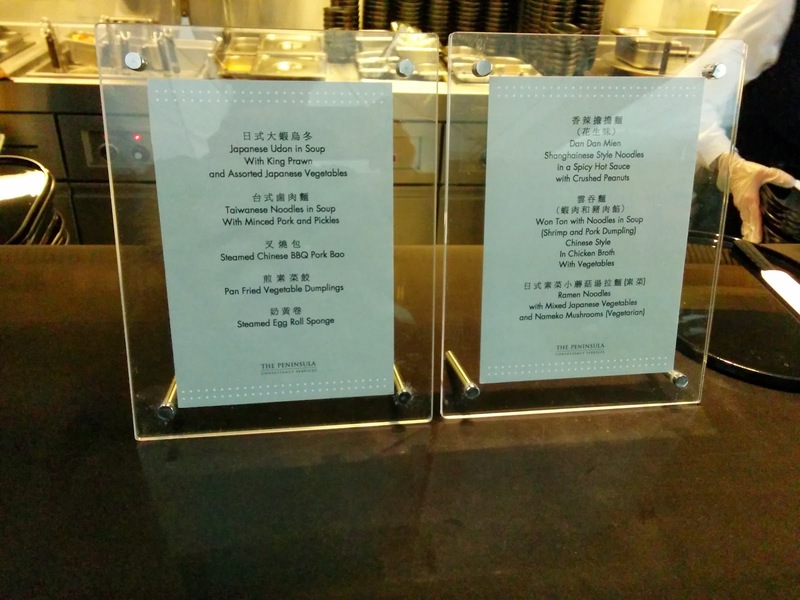 I sorta wanted to check out the business class area first, since I knew they had dim sum. But alas, up I went, as instructed. It was spacious, bright, and not crowded at all. The bar didn't even have a single patron! I walked through looking for the bathroom, and just like at the Bridge, I had a hard time finding it. Why so many secret doors in these lounges? I don’t understand! 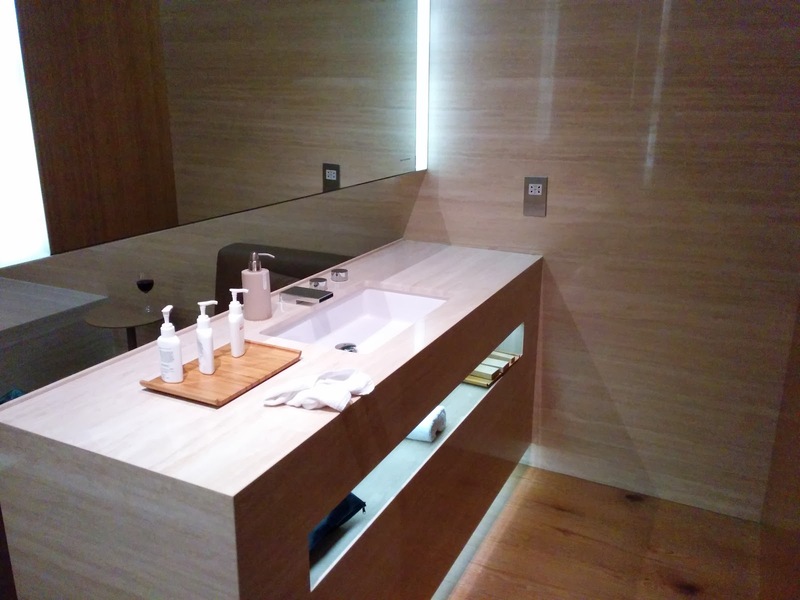 The bathroom was very nice, the stalls had their own sinks, lots of amenities. I cruised through the seating area, and it wasn’t really clear to me how things worked. People seemed to have snacks, but I have no idea where they got them. I found the champagne bar, but again, it didn’t seem like I was supposed to help myself. Later on, I again tried to figure it out. At that point, the champagne bar was closed. There was one guy sitting near there, who had food brought out to him. It looked like fish and chips? I have no idea how that happened. It certainly wasn’t on the restaurant menu. I sorta waited around to see if any wait staff would see if I wanted anything, but it didn’t happen. 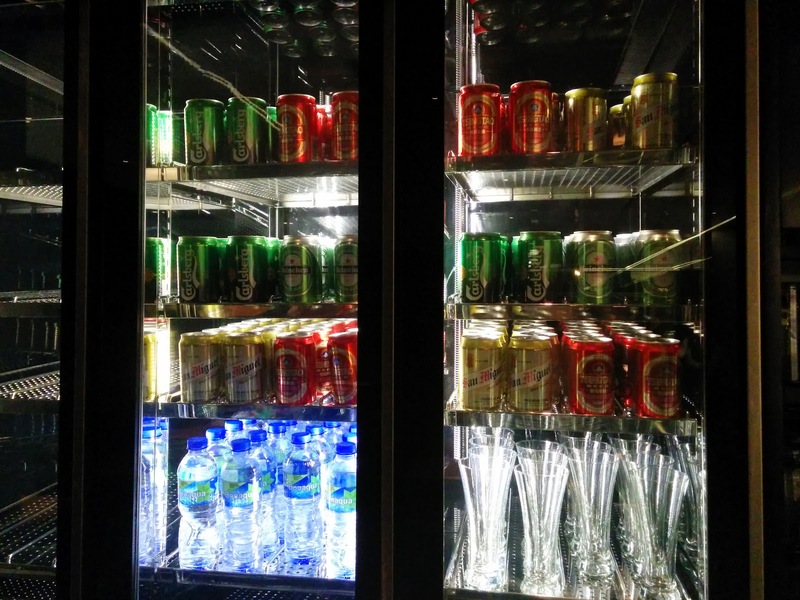 So I went back to the bar to at least get some sparkling water. I asked the bartender if he had a snack or food menu, but he said he just had nuts and chips, and that I needed to go to the restaurant. I really don’t understand how that other guy got fish and chips. Or, actually, there were plenty of people seated who had bits of food on plates next to them, and waitstaff stopped by to ask them if they wanted refills. What was I doing wrong? I still don’t understand how this was supposed to work. Anyway, it wasn't like my food needs weren't met, as I was there to visit the full service restaurant, the Haven. Yes, a full service restaurant, in the airport. Service was a bit strange. 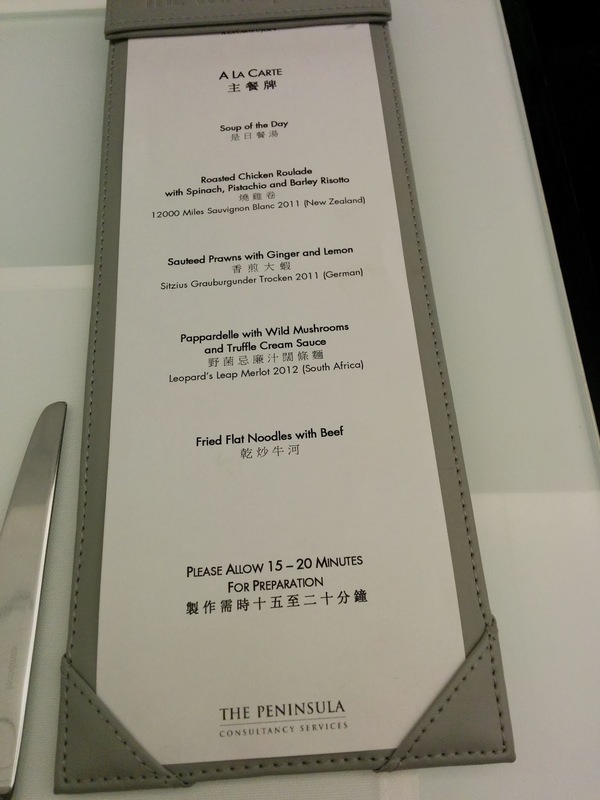 I was seated, given the a la carte menu from which I could order a main dish, cooked to order. Some of the options sounded quite good, including a pappardelle with wild mushroom in truffle cream sauce, but as if I could possibly eat a full meal right now! The server immediately wanted my drink order. I had no idea what my choices even were. I asked for a drink menu. She came back with a menu of hard alcohol and water, but no wine list. So I asked for that. She came back with one, handed it to me, and just stood there until I ordered. How was I supposed to know what I wanted so fast? I guess they expect people to be regulars? 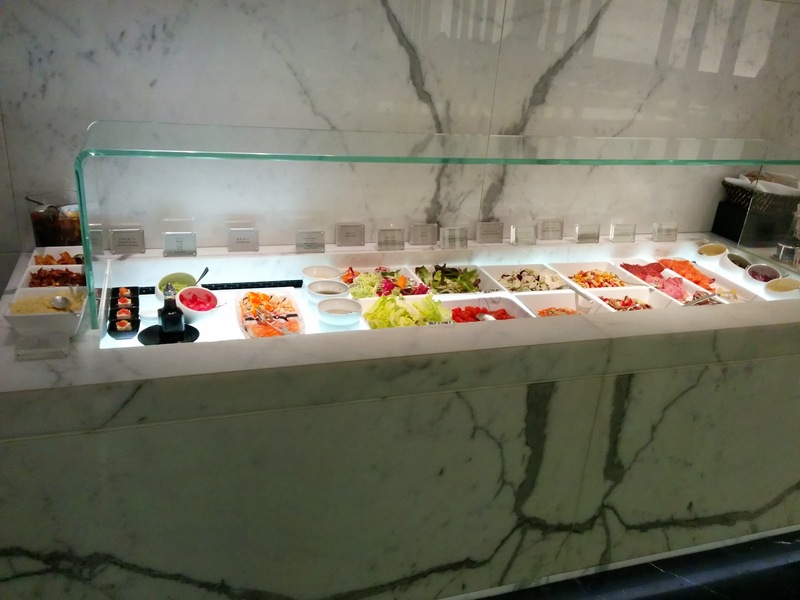 Then I checked out the buffet, starting with the cold items: salads and sushi. Sushi! In an airport buffet! I tried the mixed sushi, it was fine, but not remarkable. I was too full to really care. I enjoyed it with a glass of Moet & Chandon Rose Brut, because I could. 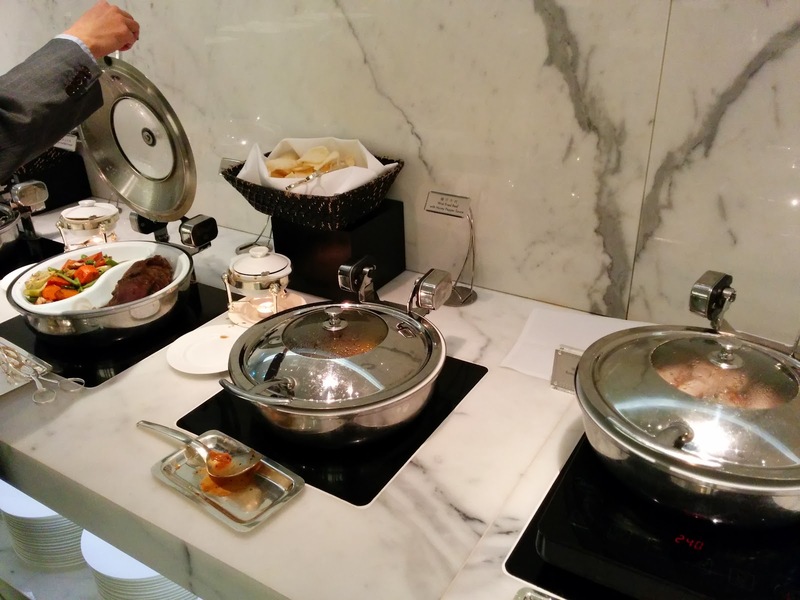 There was also a hot buffet, with a few different cooked dishes (sea bass, lamb, chicken, beef, veggies). I passed on these. And a carving station off to the side, with roast beef, veggies and potatoes, plus a server who would materialize to slice off some beef for anyone who wandered by. I also passed on this. I told you I was full! 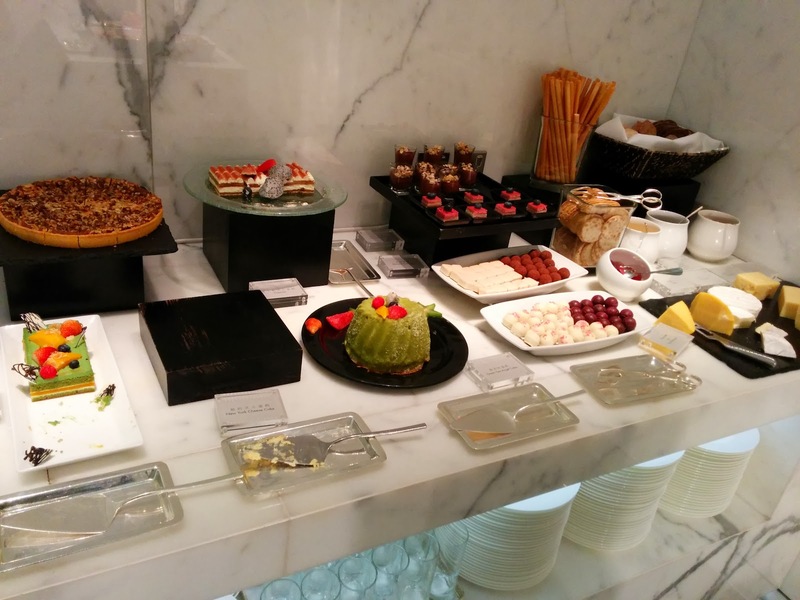 But there was also a dessert bar. ZOMG the dessert bar. Chocolates, cakes, sauces, tiramisu. Everything! Plus cheese and crackers. And fresh fruit. I feel like a broken record here, saying how full I was, but ... dessert bar! I skipped the tiramisu due to the caffeine. I skipped the strawberry mousse, the chocolate mousse, the cheesecake, as those aren't really unique items. I tried a bite of the green tea angel cake, it was ok, light, and better than regular angel cake, but still pretty boring. I added vanilla sauce to it. I had my eye on the nut tart: a regular tart shell, with a layer of chocolate, assorted chopped nuts, served warm. It was delicious, but I was so full, and, I didn’t realize it had chocolate until too late. I also wished it had whipped cream. But I still devoured it. I also tried a green tea layer cake, which was lovely; light cake layers, with some sort of cream layer, and a passionfruit (?) layer, topped with fresh fruit. And I tried the mango pudding. It was the least remarkable of the treats, mango flavored, yes, but a bit thick and strange texture. And finally, the chocolates. These were some of the best truffles I’ve ever had. There was an assortment, some white, some chocolate, with different creamy fillings. All were very flavorful, very high quality. I almost wish I’d pilfered some of these to enjoy later (not that I was ever at a loss for more food). I learned later that these are signature items from The Peninsula, who does the catering, and you can buy them at their different boutiques. At this point I was so full I wanted to keel over. I finished my platter of dessert, and decided to move on. 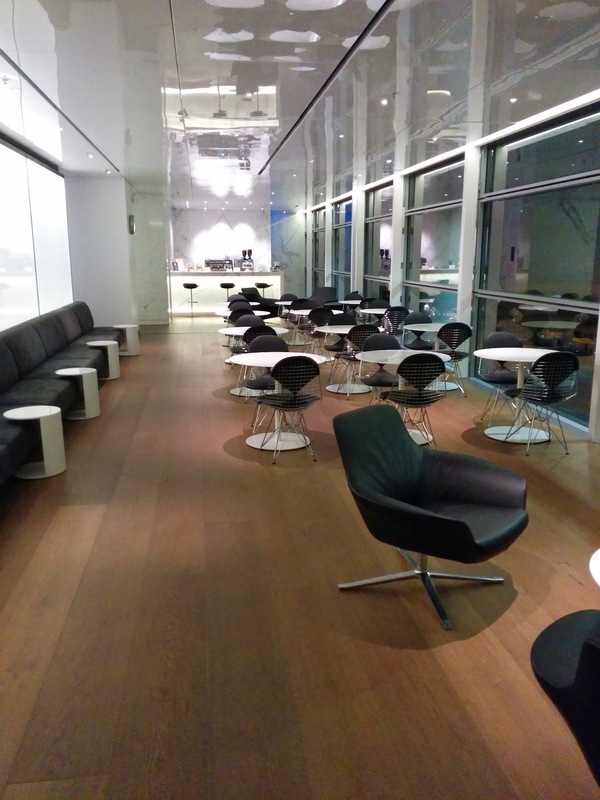 I wanted to walk around a little, so I went to see the upper balcony of the business class area. Like most of the other sections, it had dim sum, rice, sandwiches, pastries, etc. 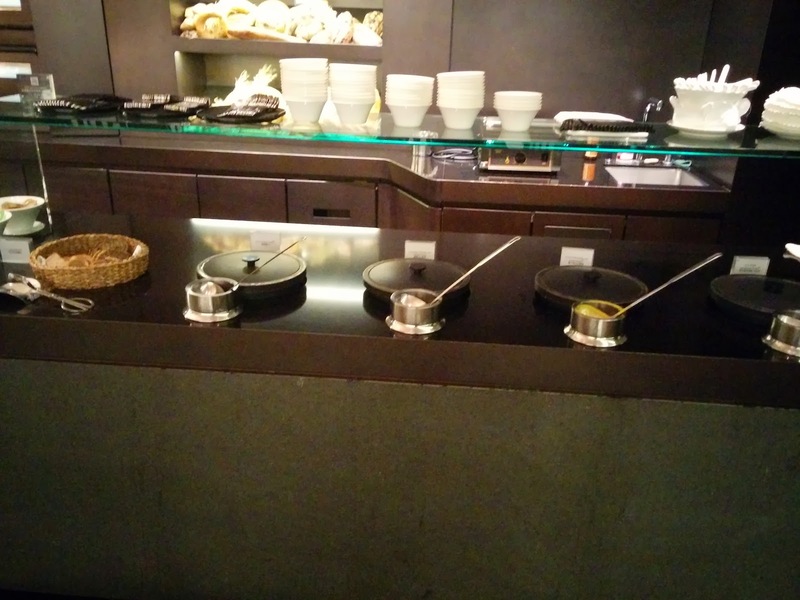 I was getting sick of seeing these same buffets. 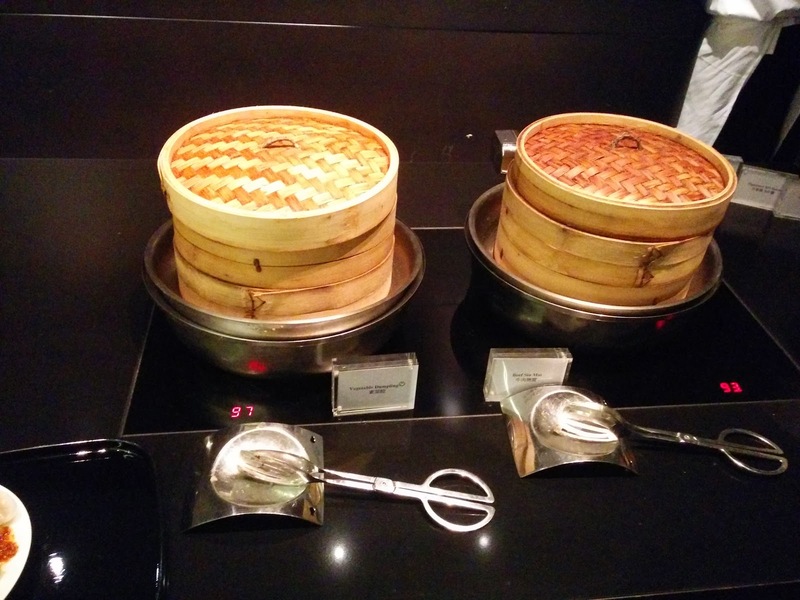 But there was also a noodle bar, with a bunch of made to order noodle dishes, and even more dim sum. I couldn’t resist. 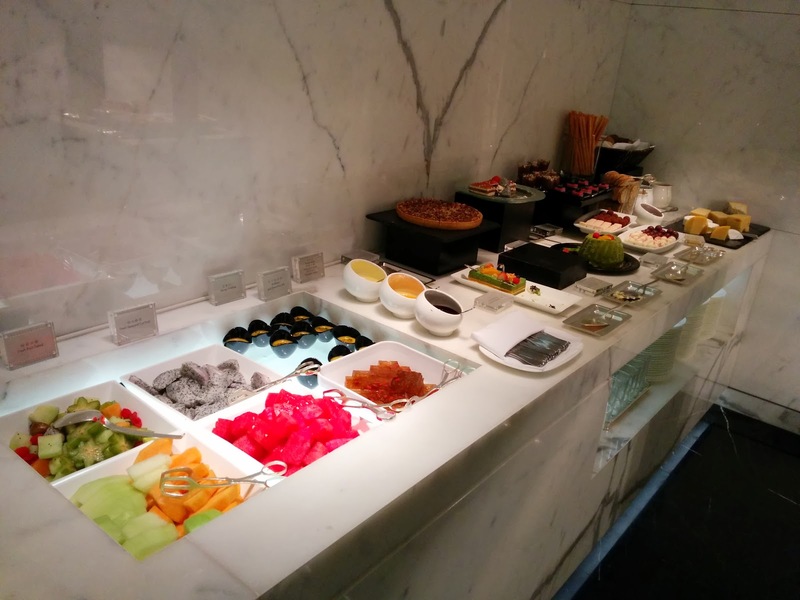 At this point, I’d had breakfast at my office in the morning, a full lunch, a few snacks at the Haneda lounge, a zillion course meal on my flight, a few things in each lounge I’d stopped by … but, dim sum! So from the noodle bar I ordered the pan fried veggie dumplings. I assumed that they’d be cooked to order like the noodles, but alas, not so. They were still good, but … I was so full that a not freshly prepared item wasn't really worth stuffing myself with at this point. 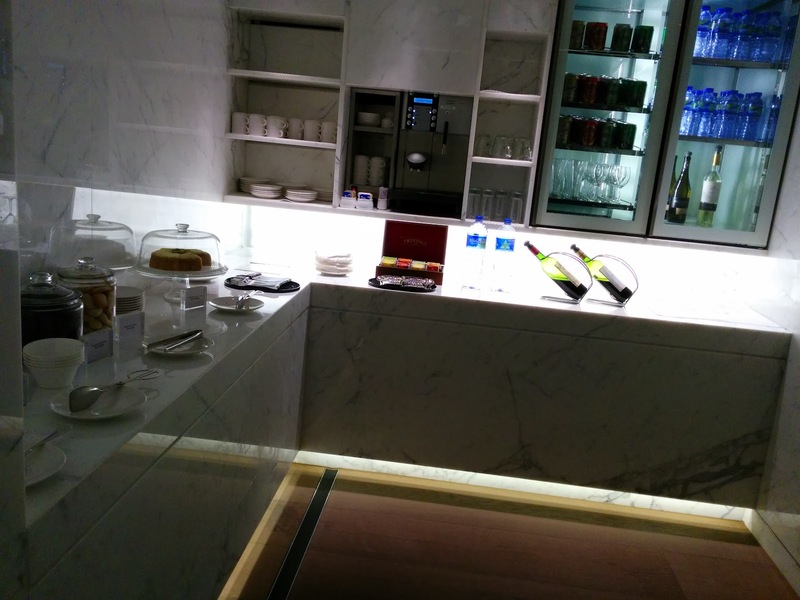 There was also another Coffee Loft, with more pastries, and ice cream. I somehow resisted. See, I can resist desserts! Finally, I wandered back to the First Class area, this time noticing the setup a bit more. It is kinda awkward, with a roped off area like the entrance to a night club to get in. Or out. If no one is there to pull it aside, it is really strange. 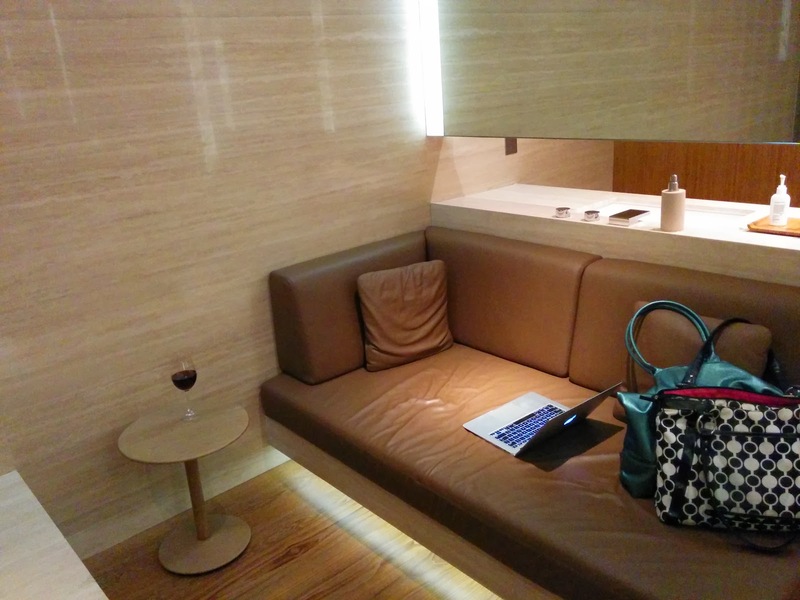 I know my friends love this First Class area, but … it really didn’t feel comfortable to me. I guess I just didn’t fit in. I went to check out the Cabanas. I knew there were only 6 available, and that the lounge was actually getting quite full by this time, so I wasn't sure that I'd really be able to get one. But it didn't hurt to check! The person at the desk started leading me to a regular shower suite, and I said, “no, Cabana. Are any available?” She seemed a bit surprised to see that they did have one free, and brought me to it. View of the Cabana Room. Once she lead me in, she informed me the bathtub was out of order. Perhaps that is why I was able to get one? I asked if there were any others, and she said no, but the shower in the cabana still worked. Oh well. The room was a sight to behold, pretty much worth all the hype. The decor was amazing. Each one pretends to be overlooking the natural outside, with wooden slats separating it from a lit area. The floors are wooden. So insane. I don’t understand how this is real. At the entry is a private bathroom, which I didn't get a photo of. Next, the sink area with amenities. Next was a desk. Or, maybe a vanity? It had a HUGE, and I mean HUGE, mirror. And the aforementioned broken bathtub. 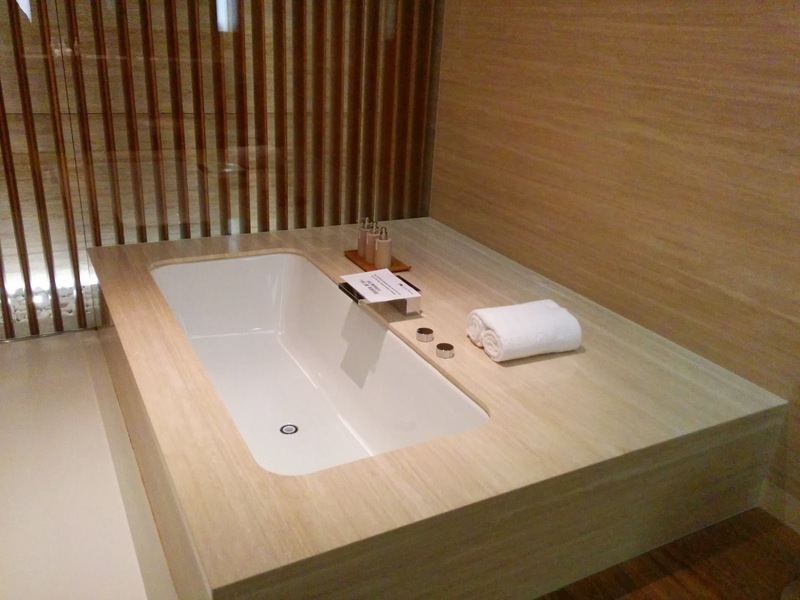 I kinda liked the idea of relaxing in the bath, but mostly, I just wanted to see these rooms, so I didn’t mind that much that I couldn't use it. And finally, a leather daybed, where I spent most of my time. And yes, I swung by the bar for a glass of Pinot on the way. I wanted to relax in style! 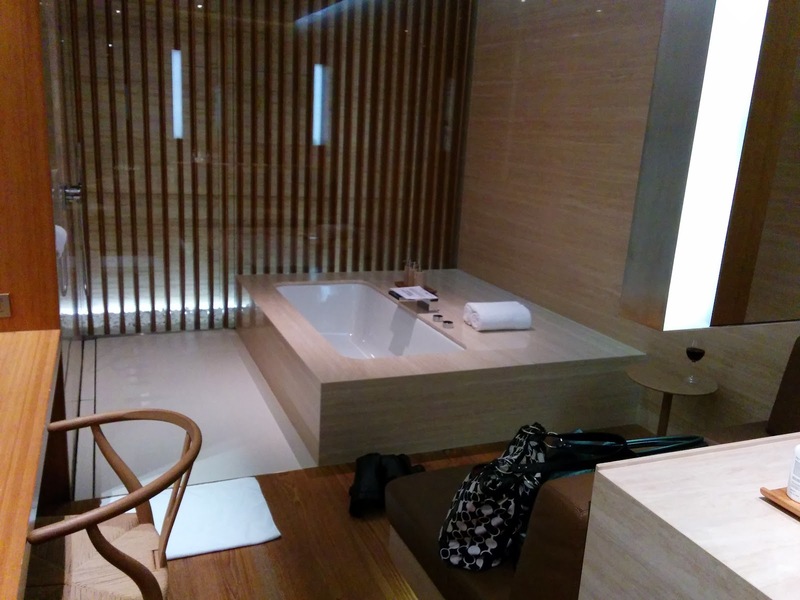 There were signs in the cabanas that politely suggested that you not spend more than an hour and a half in the room, so I obliged, although, I really enjoyed the solitude. I can’t believe how relaxed and peaceful I was ... in an airport! The cabanas are certainly worth checking out, and I imagine if you wanted to take a shower it would be even more ideal.